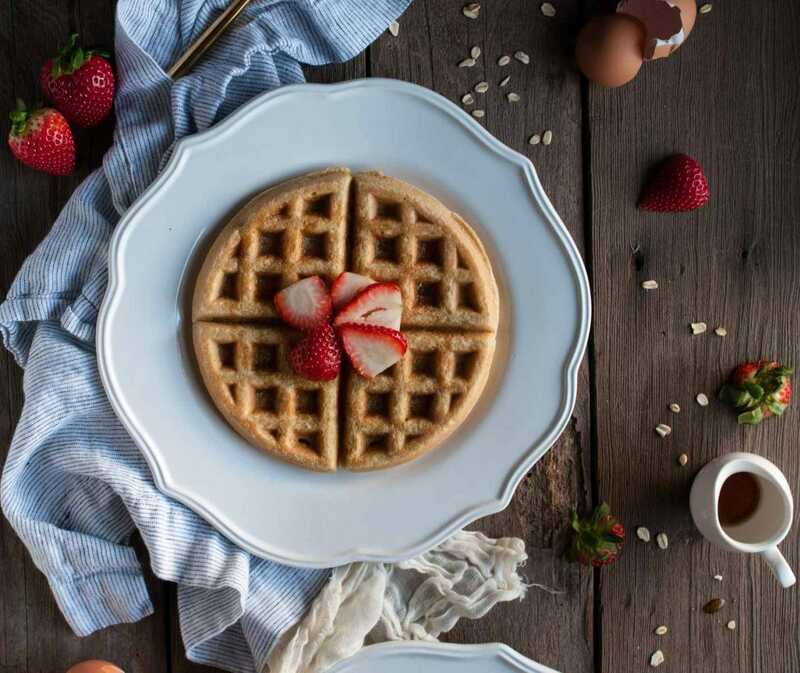 Oat flour waffles are naturally gluten free and have an added protein kick from almond flour and almond milk for energy to fuel your morning. I’m up here for a bestie weekend and it has been incredibly relaxing. The only thing I would change is probably drinking half the amount of champagne I consumed yesterday. Yikes. My head is pounding. Given this, I’ll make this short and sweet for you. 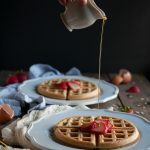 First and foremost – I don’t know how I lived without a waffle maker for so long. We bought one a few months ago and I have been absolutely loving this thing. You’ve seen quite a few pancake recipes from me already. Between those delicious almond pancakes and my protein yogurt pancakes, its about time we switched it up. 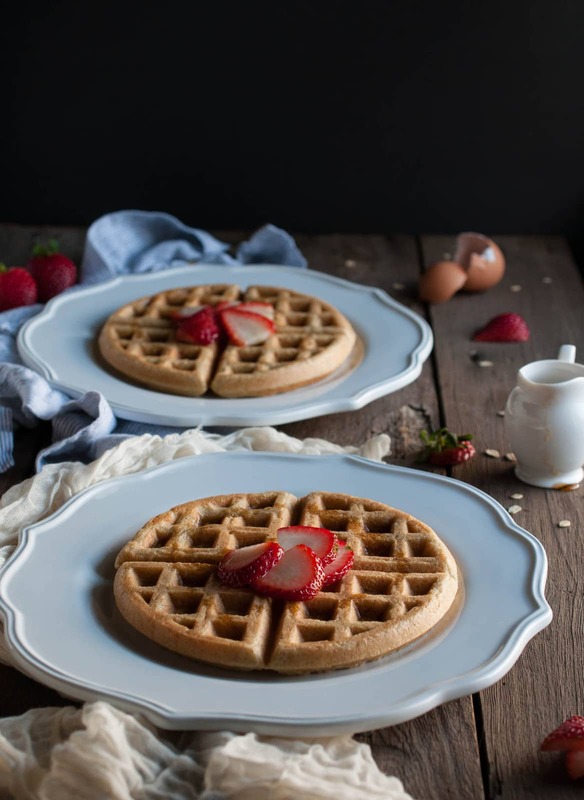 Well these oat flour waffles are the perfect transition. I’ve got more breakfast ideas swimming around in my head too so, no worries, I’ll keep ’em coming. 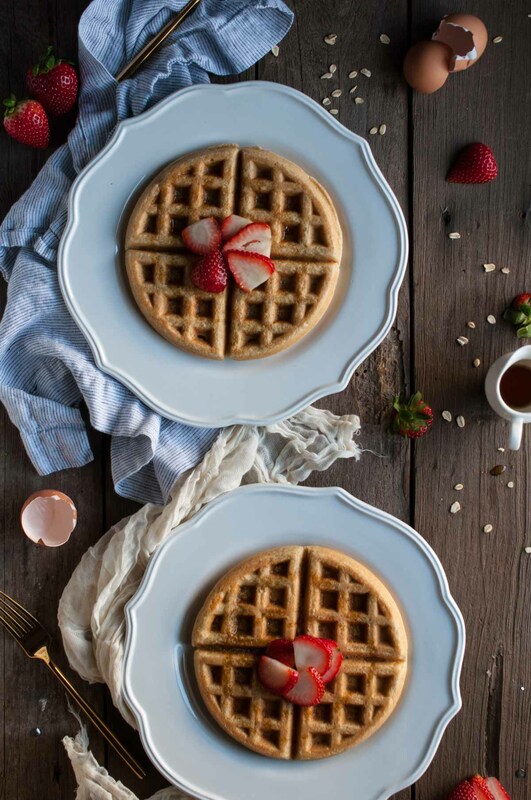 These oat flour waffles are made with oat flour and almond flour. This means they are incredibly filling. I have been making these on the weekend and then reheating throughout the week for breakfast for a few weekends in a row now. 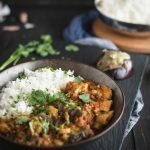 I figured its high time I finally shared this recipe with you! They don’t reheat to be exactly the same as when you make them fresh, but what does really? They are not bad at all for a quick weekday breakfast and keep me full until lunch, which is all I really care about. On the weekends when they’re fresh, I manage to eat the whole thing. When reheated throughout the week though, I normally call it good after about three waffle sections. I’m not just saying this either. I am not a dainty eater by any means. I can put down some serious food. These waffles are that filling though that I really don’t feel the need to. And for anyone wondering what oat flour is, I’ll break it down for you. Its ground up oats. Plain and simple. If you’re not using oat flour in baking, you really should be. 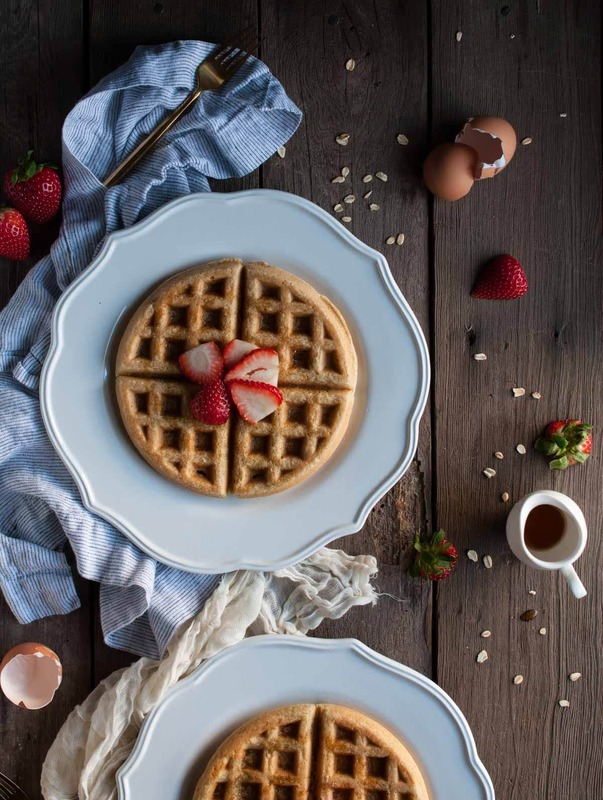 There’s nothing better than downing some delicious oat flour waffles and feeling great about it since its pretty much like a bowl of oatmeal right? A bowl of oatmeal that gets extra protein from almond flour. Double win. Don’t go buying special oat flour either for twice the price. 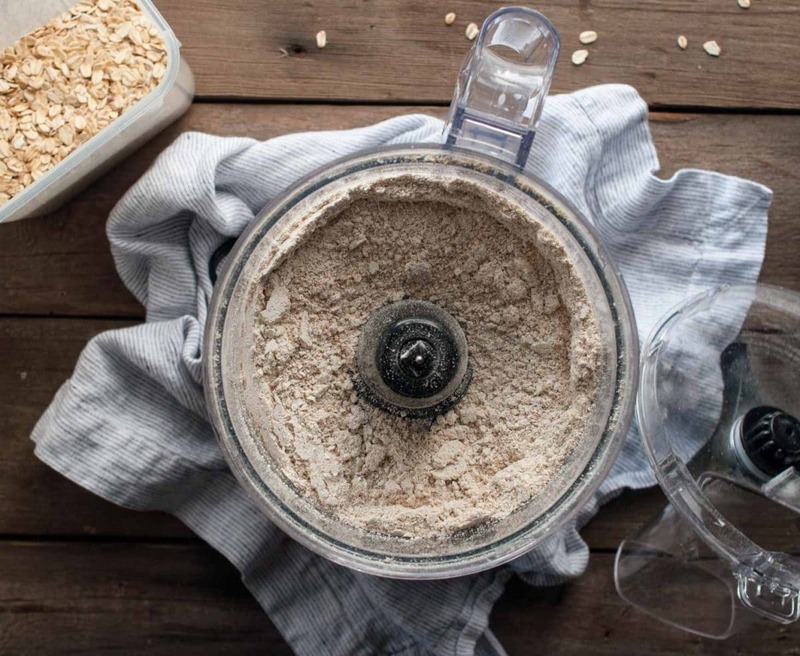 Just pulse oats in a food processor and create your own. Easy as that. 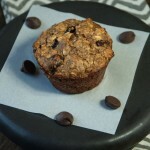 If you’re just getting into cooking with oat flour, check out my peanut butter oat flour muffins. 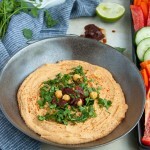 Its my most popular recipe to date. People love those muffins. I bet you will too. If you’re more of a chocolate lover, I’ve got an oat flour chocolate cupcake that is to die for. Sooo good! You’ve heard me preach about protein nonstop, but its so incredibly important to get protein in the first meal of the day. I love sweet breakfasts, but I hate being hungry an hour after eating one. I admit these oat flour waffles aren’t exactly the same as regular waffles. They don’t have to be though. These waffles are still tasty as can be, just a little heartier. Don’t be scared of the calories either! 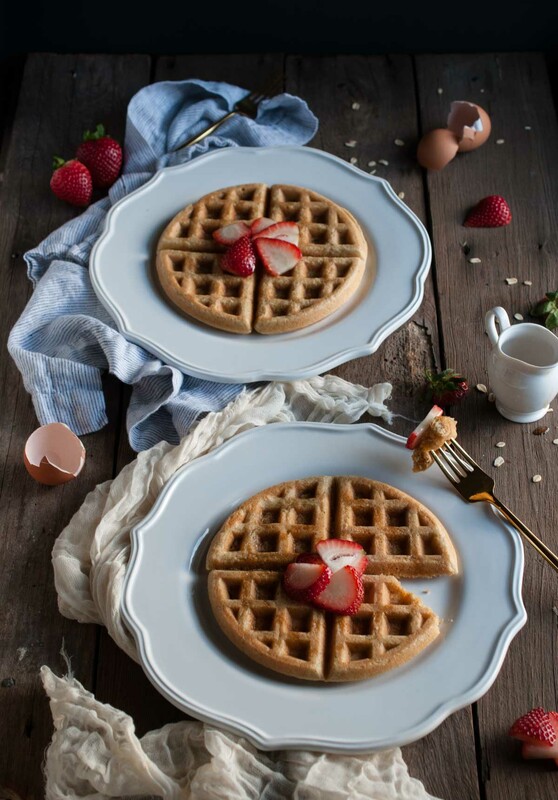 Each waffle has 11 grams of protein and over six grams of fiber. Yes, calories are important, but what you get for those calories is even more important. 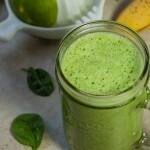 Is it junk or is it going to fuel your day? Let’s choose the latter. And throw some fruit in for good measure. It hope its still breakfast time wherever you are this weekend. 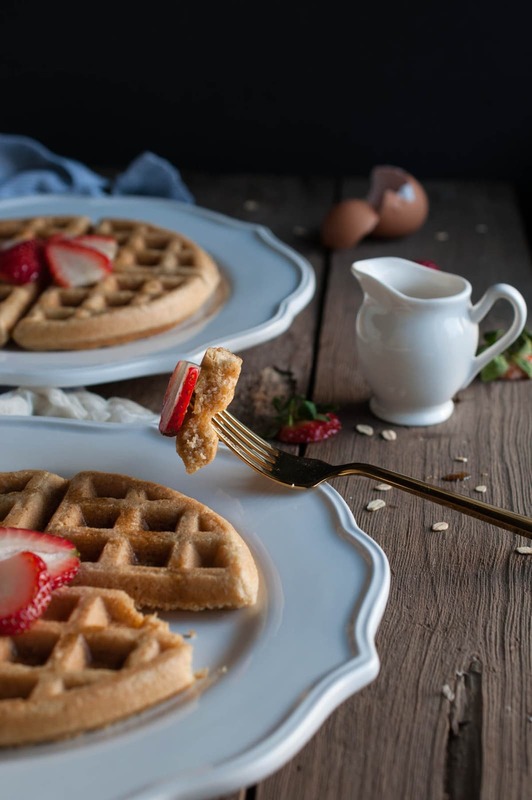 If so, stop reading right now and make these oat flour waffles. If not, save this recipe for next weekend. You can bust them out on a weekday of course too. These aren’t exclusively weekend waffles. I certainly couldn’t make that happen. I need every second in the morning that I can get. Maybe you’re more disciplined though. Maybe. If not and you’re doing the weekday reheat I mentioned earlier, just separate the waffle sections and then microwave for 20 – 30 seconds. Store in an airtight container in between. After the husband and I eat one each on Sunday, the leftovers normally make about 3 weekday breakfasts for me. He rarely eats breakfast so they’re all mine. Anyways, I promised to keep this short and sweet. Back to my girls weekend for me and on to Sunday funday for you! Turn waffle maker on to allow it to preheat. Mix all dry ingredients together. Add coconut oil, milk, eggs, vanilla, and maple syrup and stir to combine or pulse with a hand mixer and just combined. Do not over mix or your waffles will be dense! A few lumps are okay. Let batter sit for 7-8 minutes. Spray inside of waffle maker lightly with cooking spray. Pour enough batter into center of waffle maker that it will spread out to the outer parts without overflowing (amount depends on size of waffle maker). Cook in waffle maker until golden and crispy. 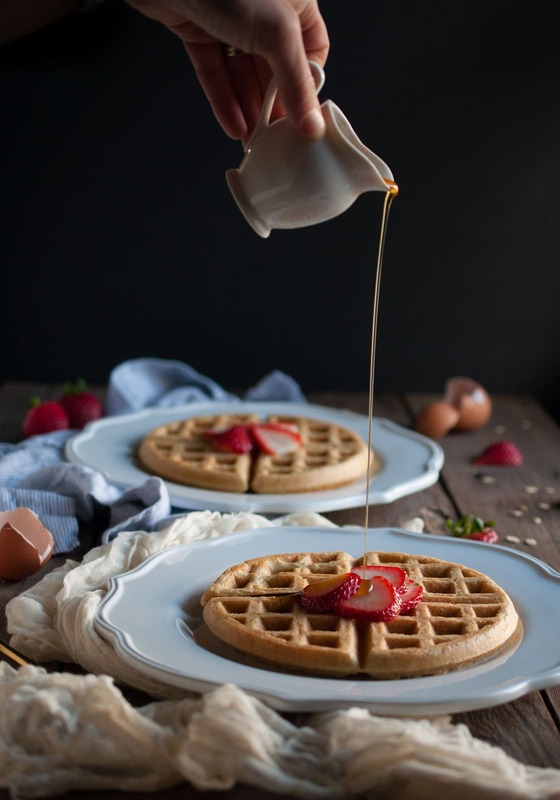 Remove from waffle maker and either plate and serve immediately or keep warm in a preheated 200 – 225 degree oven while other waffles are cooking. Do not stack waffles or they will get soggy! Repeat steps 4-6 for remaining batter. 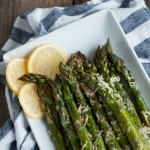 Serve with syrup or other favorite toppings. *If milk is cold, warm in microwave for 30 - 45 seconds. 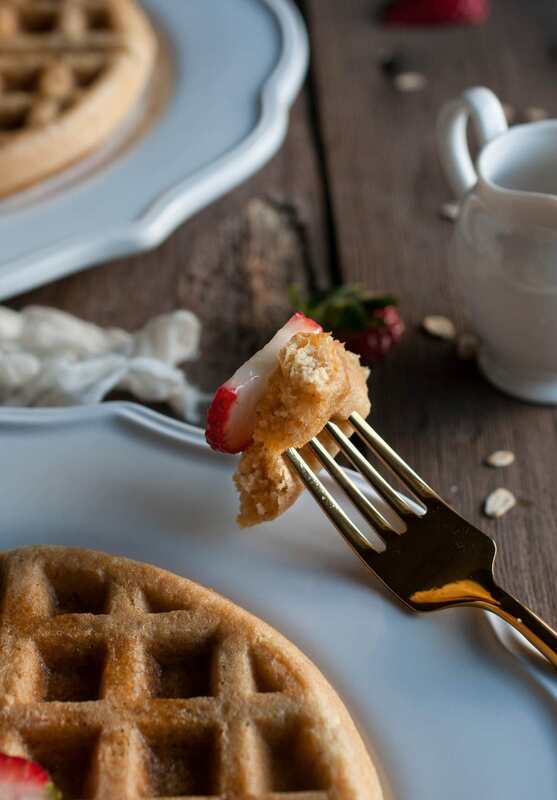 This recipe was adapted from Cookie and Kate's Gluten Free Waffle recipe. Just recently made these waffles. They were delicious! 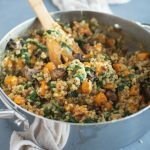 I am gluten and dairy free due to food allergies, but my gluten- and dairy-eating family loved them. The waffles cooked well and thoroughly, too. However, the batter was very thick. I even added an extra splash of almond milk to the batter before adding to the waffle maker but it didn’t seem to make much of a difference. Is there something I did wrong? Or is the batter just very thick? 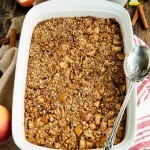 Thank you for a great tasting recipe! Really enjoyed these waffles! Had to sub regular butter for the coconut oil (I was all out). I put this recipe in my “make this again” file. 🙂 thank you! So happy to hear you liked them Lexi! They’re one of my favorites too! 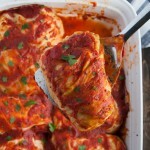 Will be trying this recipe, sounds just perfect! Your dish set is gorgeous, who’s is it by?